Olympus has added two new large zoom compacts to its line-up, with the SZ-31MR offering 24x optical zoom. The company also claims that the new SZ-31 MR has the lightest and smallest of any 20-plus optical zoom lens camera. In 35mm terms, that zoom offers a 25-600mm focal length, while it is also fitted with new iHS technologies to help with shooting in low light conditions. Featuring a 16 million pixel backlit CMOS sensor and two separate TruePic V image processers, Olympus claims that this combination offers enhanced low-light performance, speeds up camera response and improves scene and subject recognition. Dual Image Stabilisation is available to help reduce motion blur, even when walking and shooting at the same time. IS is also useful when shooting macros or close-up subjects. The SZ-31 MR's Multi Recording and Multi Framing functions enable the camera to carry out two operations at once. In the case of Multi Recording, this allows for stills to be shot while capturing full HD movie. Meanwhile, Multi Framing allows for movies at different focal lengths to be captured at the same time. Both can be done via the touchscreen. The 3-inch 920k dot touchscreen also offers touch shutter and touch AF. Other features include Smart Panorama, HDR Backlight Adjustment, Handheld Starlight Mode and Face Detection. The Olympus SZ-31 MR UK price is £299.99 and it will be available from late March. The second superzoom announced by Olympus fits into the company's "Traveller" range and features a 12.5x zoom. The SH-25 MR has also been equipped with new iHS technologies, including a backlit 16 million pixel backlit CMOS sensor. Also included is Full HD 1080p video recording, Multi-motion Movie IS and Dual Image Stabilisation. The SH-25MR also comes equipped with built-in GPS and an electronic compass with three sensor technology for accurate orientation. 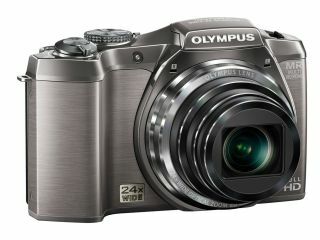 The Olympus SH-25MR UK price is £229.99 and it will be available from April 2012.